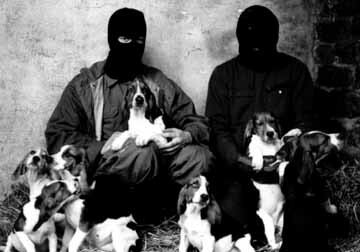 On this day in 1990 one of the most famous Animal Liberation Front raids in history was successfully completed. Activists broke into Interfauna, a supplier of animals for laboratories, and rescued 82 beagles and 26 rabbits. At that point it was the largest number of dogs taken in a single action. “Two groups made their way to Interfauna, driving onto a nearby field, along the edge of it and concealed our transport out of sight. We trekked cross country to the site and reached the back of the building in which the puppies were kept and got stuck straight into carving a large hole out of the roof. We knew the doors were alarmed, so gaining entry through the roof was the obvious choice and it took only a matter of minutes. Someone was stationed up by the house to watch for any sign of unusual movement or activity, armed with a walkie-talkie…Meanwhile the two rottweilers slept on. Once the hole was made, stepladder was lowered and within seconds the first beagle puppy was on its way to freedom. From our reconnaissance we knew that we’d be able to make good use of Interfauna’s own cages and travelling boxes – they too were liberated and are still being used to god ends. It worked a treat: four puppies were loaded into the large cages and then two people carried each cage across the fields to waiting transport. We are talking serious hard work! We began at 9pm but it wasn’t until about 1am that we managed to fill the van up, and I mean fill up – can you imagine 82 puppies piled up in cages in one van? The van only had to travel a relatively short distance to where the puppies were to be dropped off and dispersed way and wide across the country to previously arranged safe houses and holding units. So eventually the van left the area and took off to safety: 82 puppies and two people. Not bad for a few hours work. But the night was still young. We now embarked upon stage two. The plan being for the van, after the ‘all clear’, to return and in the meantime the others present would force entry into the rabbit breeding unit near to where the beagles had been held. This was a much more secure unit and it was a lot closer to the house and the two sleeping rotties. Again the initial idea had been to gain access through a hole in the roof but the difficulty and ensuing noise caused by our cutting attempts meant we had to force the back door instead – which luckily didn’t set the alarm off! In Context: Interfauna had originally been called Hacking & Churchill, named after its founders in 1974. Originally they bred guinea pigs and rabbits but in 1976 they established a beagle colony at Wyton in Cambridgeshire. In 1979 they acquired Anglia Laboratory Animals, an established breeder of lab rats and mice, and two years later they moved their rats, mice and guinea pigs to a new facility in Huntingdon. New buildings at the Wyton site led to increased beagle production and during the eighties more units were built to expand production. In 1985 Interfauna Rabbits was established at Nottingham, near Cambridge. With the ALF’s formation in the seventies vivisection came under increased pressure as laboratories and breeders were raided and suffered damage. There were a total of twelve animal rescues in 1982. These included Leicester University, Sheffield Hospital, the Public Health Laboratory Service in Bristol and, most famously, Life Science Research in Essex where nine beagles and 500 rats and mice were liberated in a raid on 14 February. Eight people were imprisoned for between 21 days and 15 months for Operation Valentine but the sentences didn’t stop a torrent of raids over the next five years. From 1983-87 were nearly 80 such actions leading to the rescue of thousands of animals. By the late eighties, however, raids had dried up. In 1988 just one took place and none at all the following year. This was mainly due to increased repression. Many raids in the mid eighties were carried out by liberation leagues, not the ALF. They usually involved large numbers of people rushing into a site and escaping with documents and animals. After one such action against Unilever in 1984, 24 people received custodial sentences of up to two years. Suddenly rescuing animals and damaging property meant hefty punishments. Tactics were evolving too. From 1985 onwards the ALF turned to timed incendiaries to set off sprinkler systems in stores which sold fur and also to destroy buildings and vehicles belonging to animal abusers. Devices like this were controversial because they carried a risk – in one case a store had its sprinklers switched off and burned down – but the effect could be devastating. By the end of the decade there were virtually no department stores with fur salons left in the UK. Meanwhile debate on the use of such tactics raged in the animal rights movement. National societies like the British Union for the Abolition of vivisection, National Anti-Vivisection Society and Animal Aid had offered some support to the ALF when it was mainly rescuing animals. Now they condemned its actions as “terrorism”, despite the fact no-one had been seriously injured. Animal Aid took the lead in attacking the ALF. 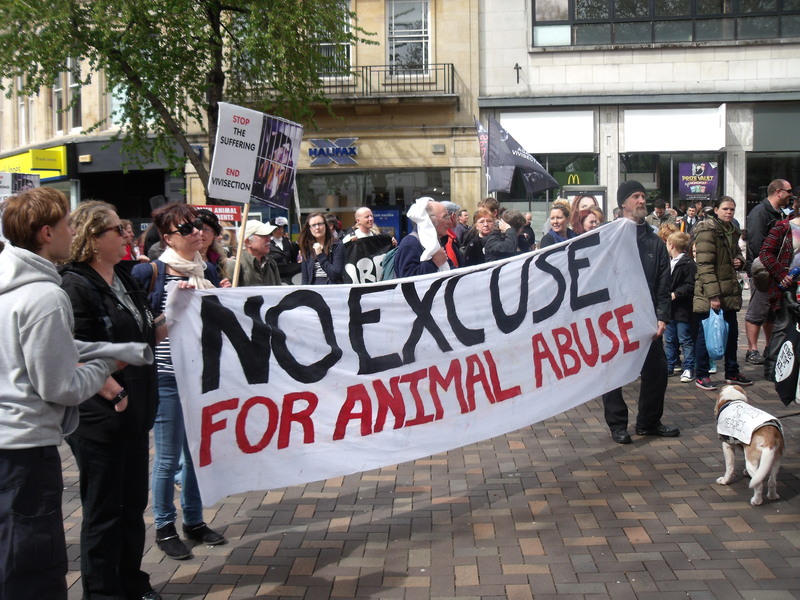 Its new campaigns officers, John Page and Jane Holgate, were activists from Manchester who had been part of the Northern Animal Liberation League. They had written a highly influential book on direct action called Against All Odds: Animal Liberation 1972-1986 which criticised the ALF for extremism and said it now stood for “the militancy of the few” instead of “the activity of the many”. By 1989, however, vivisection was again becoming a major issue for activists. There were two main reasons for this. First, nationwide uproar due to the suffocation of 79 beagle puppies in transit on a ferry to a drugs company in Sweden. They were shipped by a company called Alpha Sirius and came from Perrycroft Kennels in Herefordshire. Local campaigners picketed the site and in February 1990 the kennels were fined £15,000. The following year they went bust and their beagles were rehomed. Second, an eight month undercover investigation by Sarah Kite at Huntingdon Research Centre – the first of its type against a major laboratory in the UK. She left with diary and photos which she handed over to the BUAV, who then exposed HRC. As a result the group Huntingdon Animal Concern was formed and held protests against the lab. It was at one of these that the plan to raid Interfauna – which supplied the lab – was hatched. What happened next: After the raid a major criminal investigation was launched involving four different police forces. In early April 1990 there were 13 arrests and two beagles were recovered. Four people were charged with burglary of £29,400 worth of “property” (82 beagles, 26 rabbits and two diaries). Two others were charged with handling “stolen goods” (the two beagles, the fate of whom was left to the judge to decide after the trial). By then, however, Interfauna had already indicated they did not want the beagles to be returned because they were of no use to them. The remaining 80 dogs and all the rabbits were in safe and caring homes. The trial began on 8 July 1991 at Leicester Crown Court. There were 10 defendants. Three were charged with burglary, the rest with handling stolen goods. It had take 15 months since the arrests to bring the case to court with forensic work carried out until virtually the last minute. At the start of proceedings deals were done which resulted in five of the accused pleading guilty to handling and one to burglary. Another had their charge dropped. This meant just three defendants faced trial: John Curtin and Jim O’Donnell for burglary and James Attwood for handling. For the defence there were excellent testimonies from Sarah Kite of the BUAV and Robin Webb of the RSPCA who, according to the SG, “provided a small but shocking glimpse into the hidden world of vivisection”. John Curtin then took the stand and “gave a very convincing speech about his feelings on the moral and scientific bankruptcy of vivisection and how he felt moved to end the suffering and potential suffering of animals.” His defence was “honest intent” – he didn’t steal the beagles, he liberated them not for his own gain but instead for the sake of the animals. Jim O’Donnell, on the advice of his counsel, didn’t give evidence. James Attwood did and gave an account of how he had received some of the beagles and passed them on to new homes. The judge was very biased throughout, virtually accusing John of taking the dogs and rabbits because he hoped to get a financial reward. He also tried to rubbish the defence witnesses, accusing Sarah Kite of being in the employ of Today newspaper and therefore receiving sums of money for her expose of HRC. To account for there being no evidence against Jim to link him to Interfauna, the judge suggested he must have cleaned his van exceptionally well to remove all the forensic evidence and, if he wasn’t at the raid, he was probably committing a crime elsewhere. On 17 July the jury retired to consider their verdicts. After about four hours deliberation they returned. Jim was acquitted, John was convicted and sentenced to 18 months. Dan Attwood was given nine months. Interfauna was the biggest animal rights trial since 1987. The SG reckoned the police did a thorough job and “extreme care does need to be taken by activists as the police do have virtually limitless resources and some pretty amazing forensic techniques.” Nevertheless a trial that began with 10 defendants led to convictions for just two. The sentences were about what was expected at the time. Interfauna wasn’t the first raid of the new decade. Thirty six dogs had been taken from Oxford University’s Park Farm in Witney, Oxfordshire on 1 January. But Interfauna’s status as a target, the exceptionally large number of animals rescued and the high profile of the case, helped kick start the animal rights movement into a new phase of determination. Four more raids took place that year. Ten beagles were rescued from a breeding site owned by Bristol University while 64 cats were rescued from Oxford University’s cat breeding colony at Nunehan Courtenay, the most cats ever taken up to that point. But in terms of the impact on the movement, the raid on Boots’ laboratory at Thurgaton in Nottinghamshire on 3 November was undoubtedly the most significant. It led to the setting up of a nationwide campaign agains the company which involved local group campaigning and direct action in all its forms, from graffiti to smashing windows to incendiary devices. Eventually Boots threw in the towel in 1994. In 1991 there were even more raids, eight in total – the most since 1986. The largest of these at Royal London Hospital saw 1070 mice and four dogs liberated. This remains the largest rescue of laboratory animals in history. Above all what Interfauna showed was that the ALF wasn’t a “cult of militancy”. Incendiary devices played an important part in the struggle but so did animal rescues and other forms of direct action. In June 1990 there were two car bombs in Bristol, one of which caused injured a young child. The SG quickly condemned these incidents and reiterated the ALF’s policy of nonviolence. Animal Aid once again tried to blame the ALF and ALF SG but by now there were few people listening to them. An intriguing postscript to the raid is that one of those who took part was Barry Horne. This was only revealed after Barry died in 2001 following a series of hunger strikes while serving an 18 year sentence for planting incendiary devices against animal abuse targets, including Boots the Chemist.